We understand that being involved in an auto accident is not a pleasant experience. That is why providing our clients with excellent service is a priority at all of our repair facilities. We make our clients’ lives easier by working directly with insurance adjusters while advocating for our clients in order to make the process as simple as possible. We are devoted to provide you with the professional and courteous service you deserve as well as timely repair of vehicles, excellent customer service, and competitive pricing. Don’t lose sleep over your auto repair needs. You can trust our trained technicians and customer service representatives to help you because we go the extra mile. Check us out on yelp! What is Auto Body and What Does an Auto Body Shop Do? Estimate. Every vehicle that comes through our doors here at CID Auto Body & Paint is assessed for damage. Photos may be taken, and the information passed along to the insurance company to determine the driver’s portion of the repair costs. These are only estimates as during the teardown phase (the next phase) damage that was hidden before may become apparent. Teardown and parts order. The insurance company may request a final estimate. In this case, the auto body and paint shop will have to tear down the vehicle to see further damage. Once the insurance provider has authorized the go-ahead with repairs, all necessary parts will be ordered if the owner has agreed. It is at this phase that a rental car can be procured if the vehicle is damaged to the point it can’t be driven. Structural and body repair. The vehicle will be assessed to see if the structure is maintained. Repairs to the suspension, alignment, and frame are completed first, and then the body repair itself is commenced. Paint preparation. The parts of the vehicle that will need auto body painting are prepared. Parts are sanded, primer is applied, and then the paint, followed probably by a clear coat to protect the paint. The paint will be polished so it will shine. Reassembly. Once the car painting is finished, the auto body repair process proceeds with the car being reassembled. The vehicle’s electronics are reconnected such as airbag deployment systems and all trim, door handles, and other materials that were removed for painting purposes are restored. A test drive by an auto body technician will follow to ensure all the parts fit together tightly and everything is in working order. Detailing. The car will get washed and polished to a shine. The interior will be cleaned, the lights tested, and the car will be tested to make sure it is running smoothly after all the auto body and paint is finished. Final inspection with customer. Once the customer arrives for pick-up, all auto body repairs will be reviewed with the client, and the car inspected before the client signs off on the vehicle. Usually, in the case of impact, the automobile suffers damage not only to the body of the vehicle, but also to the paint. CID Auto Body & Paint in San Marcos specializes in both restoring your vehicle’s shape to originality and it’s outward appearances as well. We’re your one-stop-shop for when you suffer an automobile accident or incident. Most likely, your vehicle may have a damaged or broken window. CID Auto Body & Paint offers glass replacement and glass repair services as well. When you get in an automobile accident, you’re often jarred. Your routine is thrown off, and you now have to deal with insurance claims, auto repairs, and possibly injuries to loved ones. 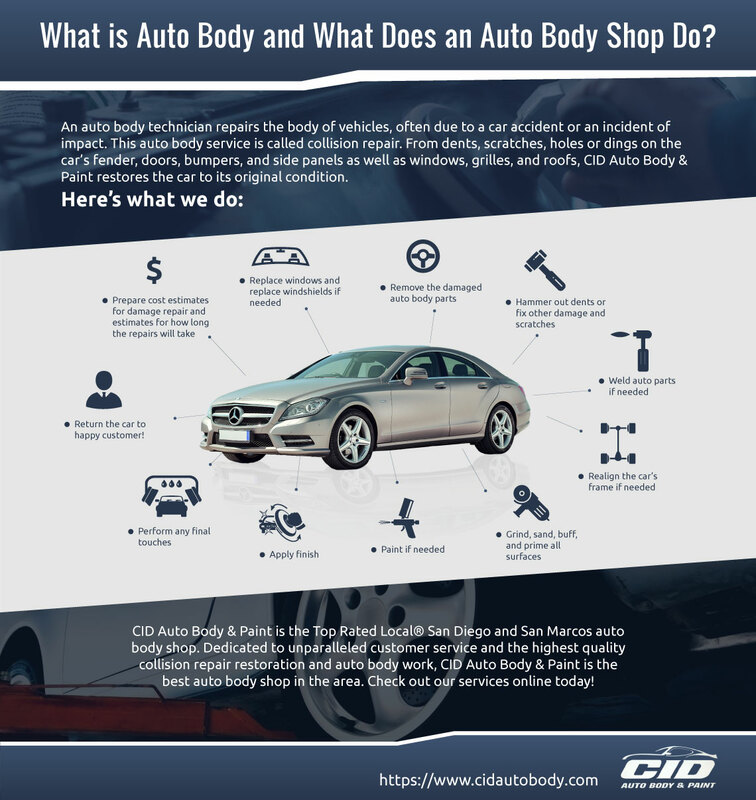 CID Auto Body & Paint aims to take the auto repair side off your plate and aid in the insurance claim side as well as much as possible with regards to auto repairs. We have an auto body shop in San Marcos for your convenience. As the Top Rated Local® Auto Body Shop in San Marcos, let us take care of your vehicle, while you take care of more important things such as your family. Call us today! An auto mechanic (or automotive technician) repairs and maintains motor vehicles of all types. They specialize in the diagnosis and analysis of vehicles to determine the repair needs of the vehicle. Inspection services are also offered. Some automotive technicians choose to specialize in certain types or brands of vehicles. Others will repair all vehicles. This can be further specialized to just a system such as transmission or engines. Most auto mechanics are certified in a variety of specialties, which may include over-the-road trucks, four-wheel-drive vehicles, or suspensions. However, most auto mechanics are able to perform all routine maintenance from tune-ups, oil changes, tire changes and repair, and fix brake pads. Like the auto mechanics themselves, some auto repair shops specialize in their services such as just offering oil changes or tires. Others are more general and repair all problems with the vehicle as well as offer all maintenance options such as new tires and oil changes. The role of an auto mechanic has evolved as cars have evolved. As vehicles are now more complicated with computer systems and electronic systems, auto mechanics are more skilled than before. With alternative fuels, electrical cars, and solar-powered cars, auto mechanics must be able to repair these vehicles as well, which often boast a completely different system under the hood than a traditional car or truck. WHAT’S AN AUTO BODY TECHNICIAN? As you might have guessed, an auto body technician repairs the body of a vehicle. The body of a vehicle often needs repairs after an automobile accident or some other incident where the body of the car or truck is impacted. This is often referred to as collision repair services. The goal of an auto body technician is to restore your car or truck to its original shape. This includes fixing any dents, scratches, holes, or dings. Fenders, doors, bumpers, and side panels are the most common fixes, but hoods, windows, grilles, trim, and roofs are common auto body repairs as well. The car’s frame will be realigned if needed. Dents and other damage will be patched or hammered out. The parts of the vehicle that need to be welded occurs. Any final touches are performed. An auto body repair technician can repair most damage from vehicle collisions. The tools needed for these often complicated processes can be complex as well. All of our auto body technicians are certified in multiple areas, and we offer honest cost estimates. CID Auto Body & Paint in San Marcos takes pride in having your car returned to you in better condition than when it was brought in. We’ll fix any and all problems related to the body of the vehicle. Contact us today for a free estimate!